After all the Christmas decorations come down in my house I love to use twigs and branches to decorate. I like it a little more spare after all the excesses of Christmas. A little spray paint in the color Chrome did the trick this year! Find a great branch with lots of interest and spray 'em up! 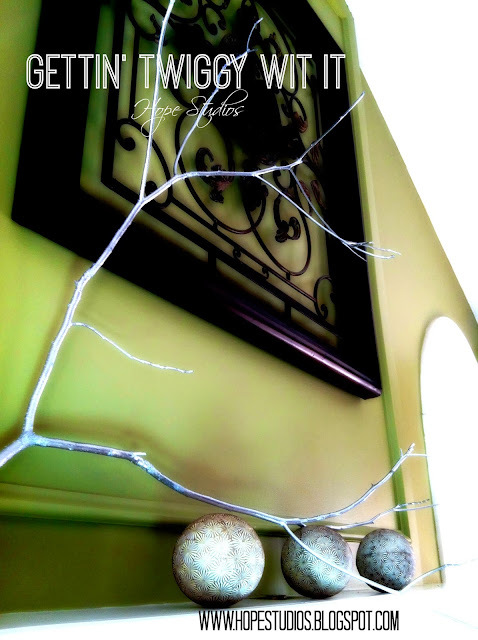 Set it on your mantle or a shelf in a simple display to highlight it's natural beauty...as natural as a chrome-colored twig can be! naa na na na na na na naa......... Thanks for that song now replaying in my head :) I love decorating with branches too ~ height, textured, dimension, and inexpensive (aka, cheap or free).